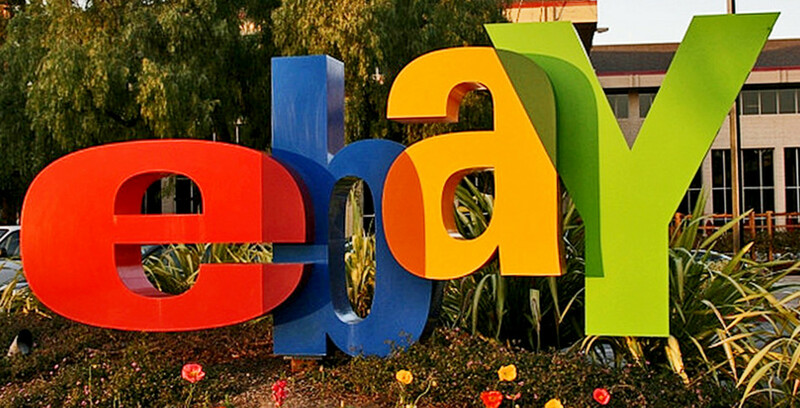 Ebay will be covering up empty storefront windows with “shoppable windows”. 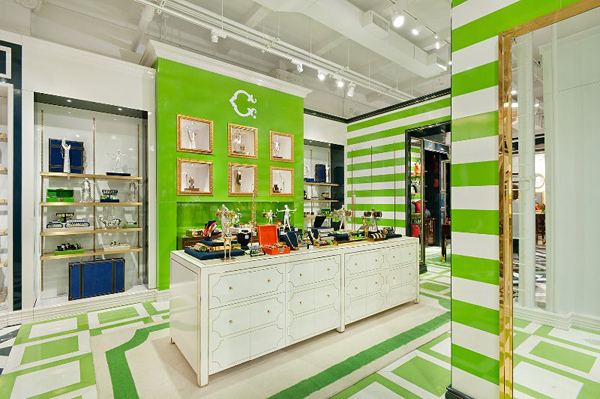 The interactive windows will allow shoppers to purchase items from Kate Spade’s Saturday collection. You will order the items on the big screen and have them delivered to you within the hour. The customer pays the delivery person with a Pay-pal credit card reader. This is one way to connect your brick and mortar store with the digital world! I’ve always told students that you should treat your windows as another sales tools. Ebay now proves it! I don’t make my students shy away from doing displays that are provocative or controversial. I say push the boundaries! But when I came across this article in the Daily Mail, on the windows skin-care retailer LUSH did, I wondered if they crossed the line? Although I do not find what they did offensive, it does turn my stomach a bit and does not make me want to go in their store. Which completely defeats the purpose of visual merchandising! I applaud their efforts to bring animal cruelty in the cosmetic industry to the public’s attention, but when I hear the word LUSH and think of skin-care, I envision beauty and goodness. What do you think? I’m interested to hear your thoughts on this. 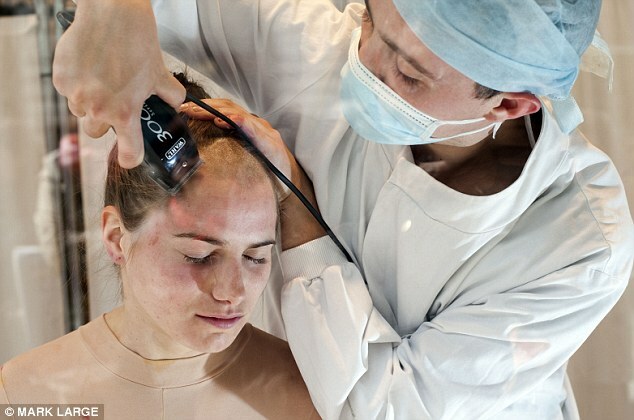 Here are a few pictures from the full article, although read the article so the photos are not taken out of context. These first photos are from the store Man 1924 in Madrid, the photos are taken by Scott Schuman of The Satorialist. 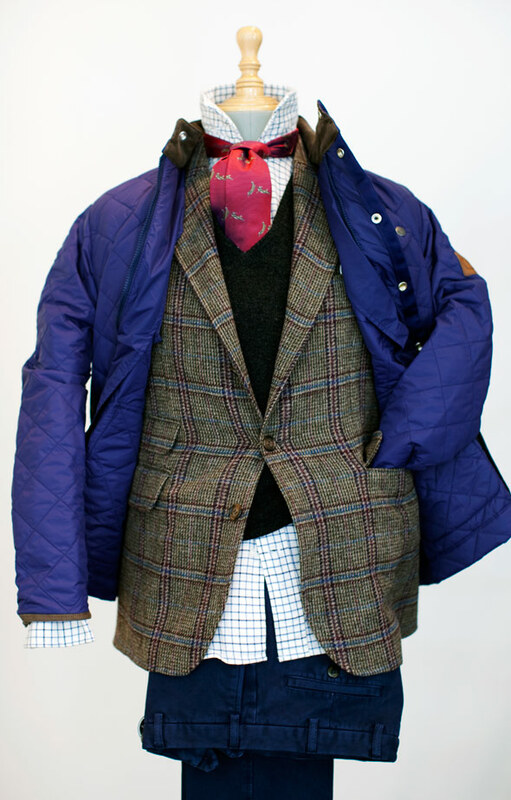 I think the store owner does a great job of layering the clothes with different textures and fabrics. I especially like how they display the pants, much simpler than pulling them on the bust-form. Dressing bust-forms is far more difficult than mannequins, because you have to create the shape and volume so the clothes don’t lay flat. Here’s a cool video recently released by Barney’s, it gives you a quick behind the scenes peek on how the Christian Louboutin window’s were created. Christian Louboutin: Celebrating 20 Years and the Launch of the Book from BARNEY’S NY/ Michelle Chu on Vimeo. 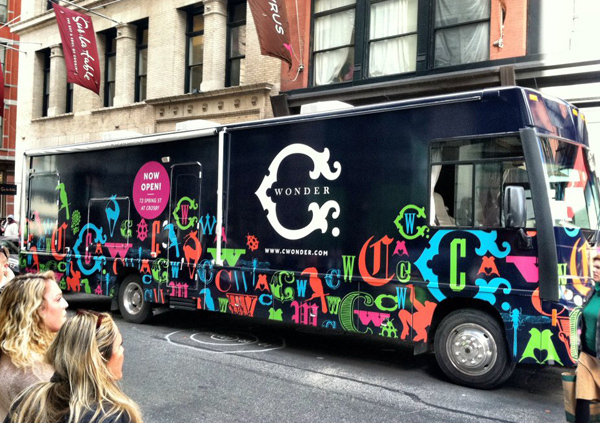 Have you heard or seen the new store C. Wonder? 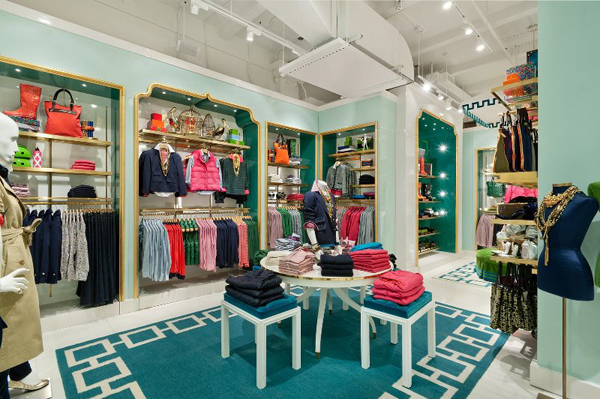 Entrepreneur Chris Burch, and force behind the Tory Burch brand, has branched out and opened his own lifestyle store! 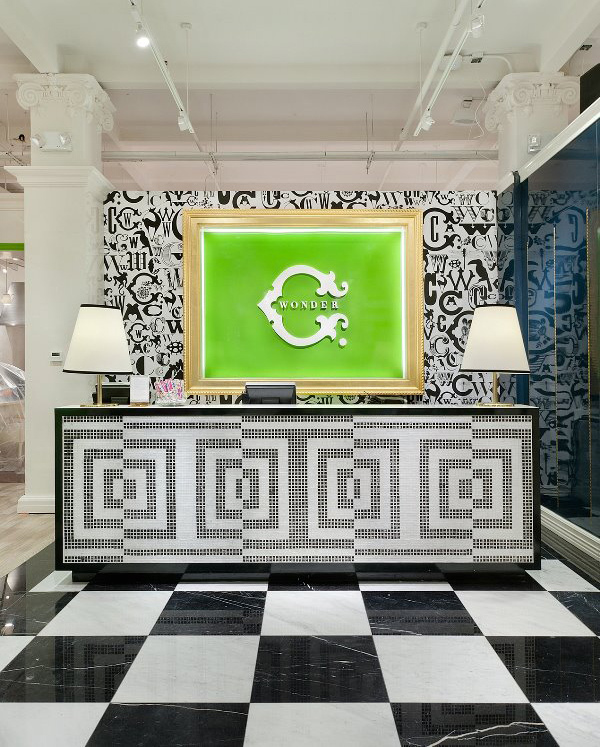 C. Wonder takes store ambience to a new level. Each sales associate comes equipped with a iPad for purchases, and you can change the music and lighting in your dressing room! 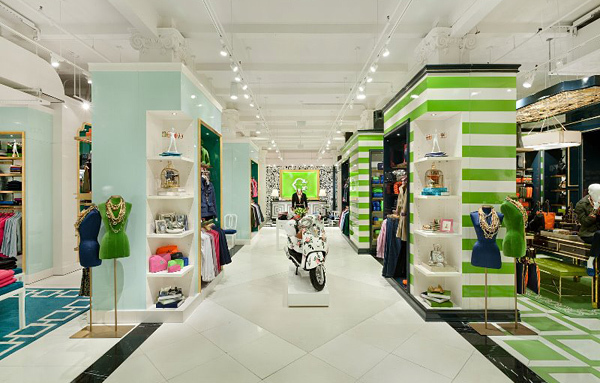 The use of bold and bright colors makes this store look like a really fun place to shop! The cashwrap does not look like your traditional register area – love it! I have to admit it looks like Tory Burch meets Kate Spade. Do you agree? Great merchandising, this it what your dream closet would look like! Lots of WOW factor without being too over the top and in your face! Notice that the store design is simple with a few architectural touches here and there; what is drawing your eye in is the use of color everywhere! The light fixtures are teapots! What are you finding around the web? The last paragraph from the post: What is good display? Got me thinking about the display calendar and how important it is to the visual merchandisers. Displays aren’t installed haphazardly, well professional ones aren’t! Just about everyone follows a display calendar so you know when displays need to be changed according to the season, trend, or sales event. This is especially true for the window team! The calendar is an essential tool for the visual merchandiser, it helps you anticipate the upcoming promotions, plan out your process, and make sure things go according to plan. It’s also a way to communicate the fashion merchandising team, as they will want to make sure merchandise that is to be promoted is in the store at the designated time. 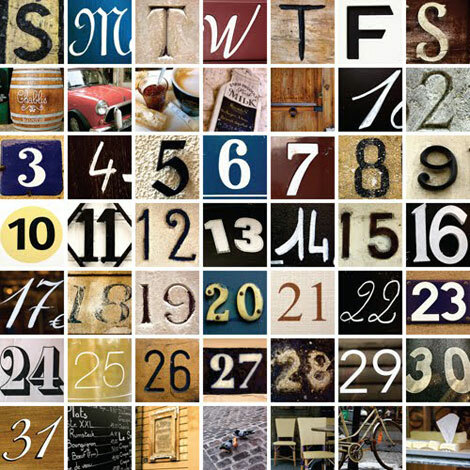 Just as the world of business has a “fiscal year” – and they don’t always start with January – so can a display calendar. Choose when you want your “year” to start. Most big retailers with in-house crews use Christmas as the start of their year. Your calendar doesn’t even have to run the traditional 12-months. Some retailers even use 18-months to really plan ahead! I would even advocate for a six to eight month calendar. Why? Fashion is a quickly evolving industry. Sometimes planning too far ahead and feeling as if you are stuck with that plan doesn’t give you much room to adapt to the trends. When planning your calendar be as creative as you want with it – hey that is what we do – but make sure your team and everyone else who uses it can read and understand it! Always put your big promotions on there first: major sales, Christmas, Back to School, things you know are traditional and don’t change. Next schedule your smaller promotions: Father’s Day, Thanksgiving, Valentine’s Day. Once you have these on your calendar this allows you to see the weeks you need to fill in with trends, promotions, or new collections set to arrive. Don’t forget to have a discussion with your fashion merchandising department as they may have special events they want displayed in the windows and store. Now that you know what promotions and holidays are coming up you can look at your budget, allocate accordingly, and order materials/props well in advance. Don’t forget to schedule time to remove your old displays as well, this usually doesn’t take all day, but it’s still important to give yourself time in the schedule for it. I don’t care how big or small your store is, you still need to give yourself a display calendar. I hear customers say all the time how disappointed they are that certain stores don’t change out their windows often enough! 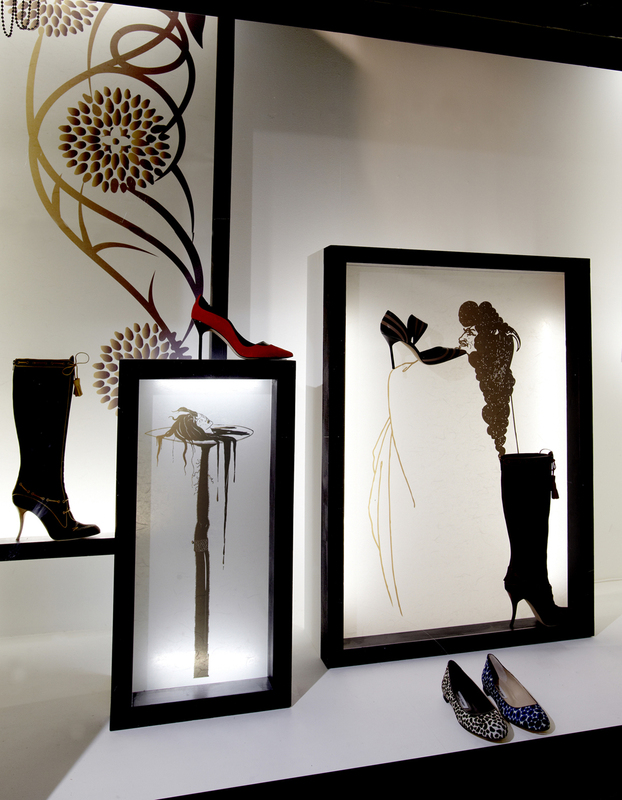 Keep yourself on a regular schedule and your displays will always be fresh and new! She goes from one highly coveted job to another! Carine Roitfeld, the former editrix of French Vogue has now been tapped to help style the fall campaign for retailer Barney’s New York. She will work on their catalog, a short film, and the Windows! I guess a girl can have it all. 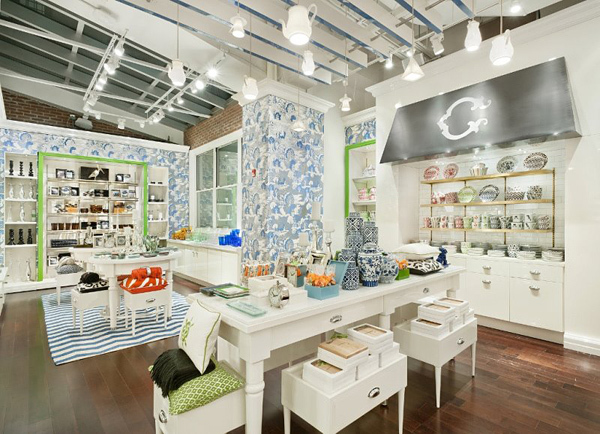 This week’s store study assignment is by Lisa G.
What does the store design tell you about the retailer? Overall this store is not that big and they only carry a small selection of each size. The store is very inviting and there are a lot of bright colors throughout the store especially when focusing on the clothing. 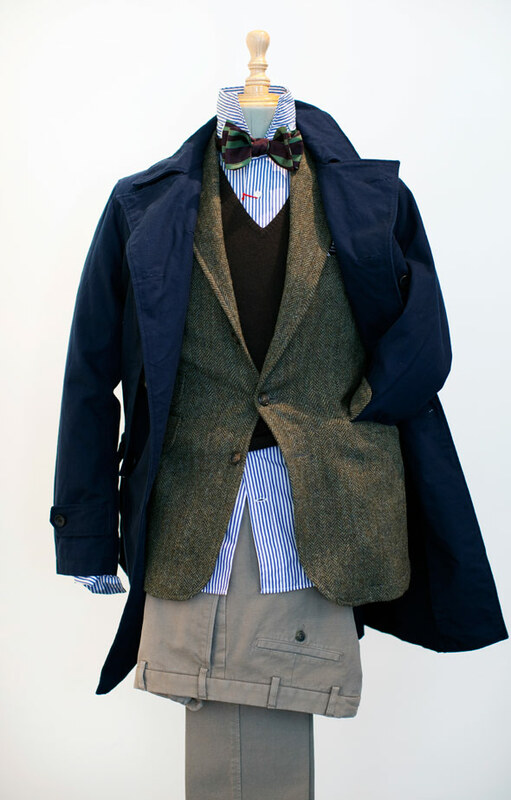 From the store’s layout and clothing selection I would say it caters to somebody with a more European taste for clothing and somebody who is a little bit edgy and willing to try a look that might be outside the box. Describe the store’s target customer? I would say the target customer is somebody in their 30s who can afford to dress nicely but yet still not spend an exuberant amount of money. 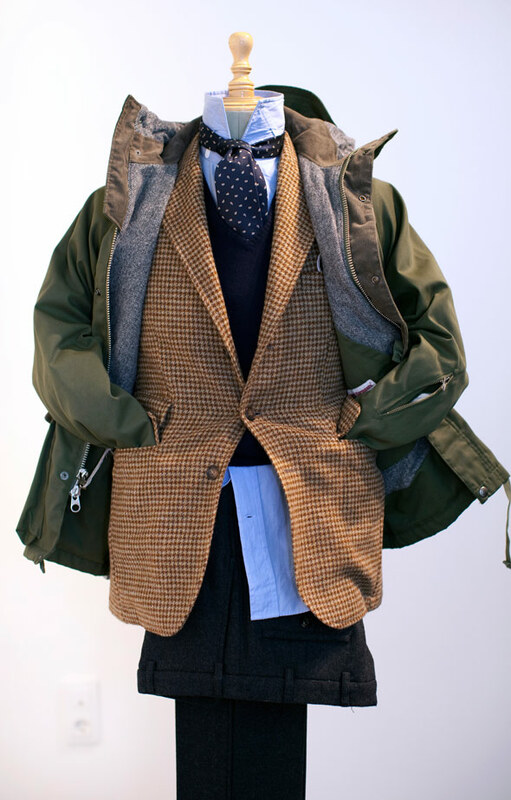 Their target customer is definitely into fashion and wants to select clothing that is going to get them noticed. Is the merchandise displayed in an accessible manner for the customer? Overall I would say the merchandise is displayed in an acceptable manner but as I stated above the store is kind of small. With that said I think they have too much clothing in the store. They have a lot of racks throughout the store so it makes it hard to move around. I would eliminate some of the clothing racks. Is it stocked pile or more minimalist? The store is more minimalist and there is no stock piling. There are a few pieces laid out on a table for show but overall there are just clothing racks throughout the entire store. Do the fixtures suit the store environment? Does the lighting highlight the merchandise? Yes, the lighting highlights the merchandise. The lighting in this store is very bright and enhances the clothing since a lot of the clothing is in bright colors. The lighting is especially beneficial in the dressing rooms. The dressing rooms at this store are huge and good lightning makes it that much easier for you to see what you are actually trying on. How is color used in the store? The clothing in this store is very colorful. They do not keep to the black, white and gray tones. The clothing that was out today consisted of reds, blues, bright pinks and a few black and white items. I would say besides that they do not use that much coloring. The interior walls are a brown/ wood coloring. Are the windows pleasing and drawing you into the store? The windows are very simple since they are having a 60% off sale. When I look at the mannequins in the window I am not drawn to the store based upon what they are wearing but more so that there is a 60% off sale happening. 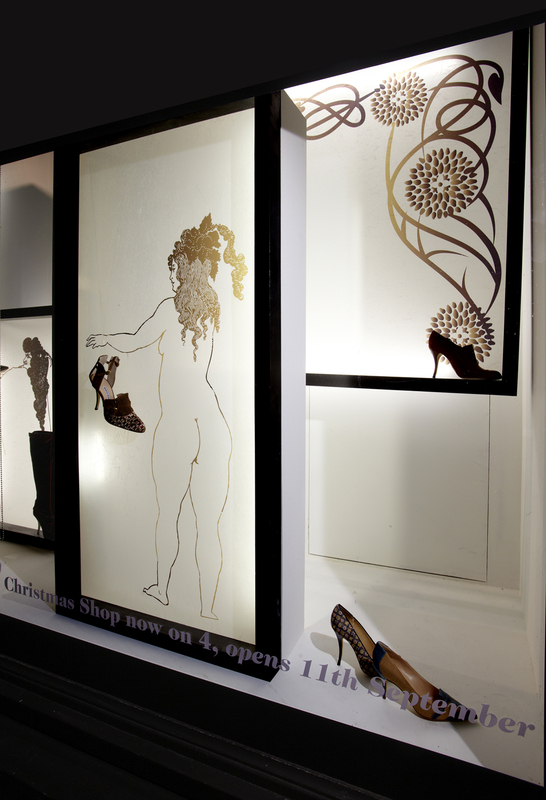 One window display advertised their new collection and another window displayed let the public know about the sale. For the Sale window I like how the word Sale was written across the window. For the new collection window I think it is kind of boring and it wouldn’t grab my attention and draw me into the store. If you could make changes in the store what would they be? 1. 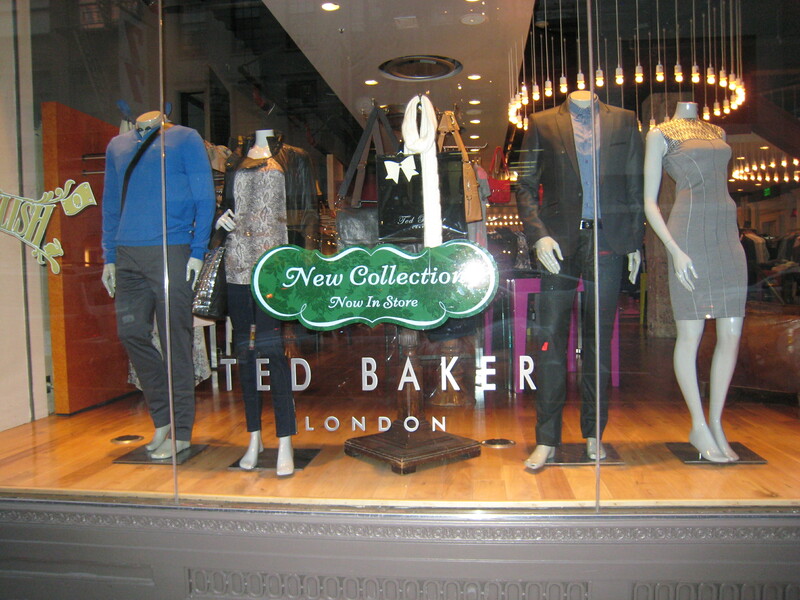 I would change their new collection window display to something exciting that is going to draw people into the store. First off they have 4 models and I know in class we learned to have an odd number of mannequins. Second, there is no exciting focus point in this window display. When I look at this window my eye goes directly to the center which is a pile of purses. I would maybe do some theme around their new clothing line. They should think about who is going to be purchasing their new collection and do a window that targets those customers. 2. I would remove some of the racks in the store and consider building shelving into the wall so they can fold some merchandise and place it on shelves. There is not much space to walk around in this store and all the racks on the floor make it even more difficult. I thought the men’s section was way too crowded. Thanks Lisa for a great assignment! 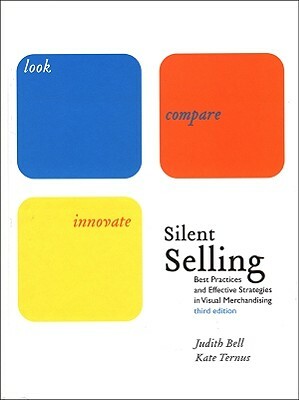 This past semester I’ve been supplementing my lesson plans with information from the textbook Silent Selling: Best Practices and Effective Strategies in Visual Merchandising, by Judith Bell and Kate Ternus. I do not make textbooks a requirement for the class because students have to spend money on their group projects, but I would like to highly recommend this book. This book teaches you everything about our industry as a whole, while others tend to focus only on “doing windows”. If you are some interested in studying up on merchandising a store and not just making pretty displays, then as a teacher I recommend you get this textbook; and for the teachers I recommend you incorporate some of their lesson plans into your own curriculum. Take your time going through it, as you can get overwhelmed with the amount of information they’ve put into it. Happy reading! Welcome to the new semester of Fashion 49 – Visual Merchandising. Most students tend to think this class is all about “doing windows”, while we will touch on that, the main focus of this class is to prepare you for the wonderful of visual merchandising as a whole – not just the windows but the entire store! I look forward to working with each of you, as I must admit this is my favorite class to teach (and I’m not just saying that)! I’ve been doing displays since the age of 17 when my first boss, Debra at Contempo Casuals make me the “visual girl”. I’m going to try to keep the information up-to-date and post items that we covered in class, bear with me if I get a little behind as I do teach a bunch of other classes in the Engineering and Construction departments (see how far you can go with a design background!). Well class, it looks like there will be a new “required reading” book. 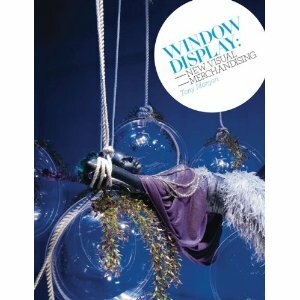 Tony Morgan has published a fantastic new book all on Window Display! But don’t fret yet – this book is a big picture book, it belongs on your coffee table with all the other fashion books. , for that you should read Tony’s other book, which I use as the textbook for this class – Visual Merchandising – Window and In Store Display for Retail. This book is a great reminder of why I LOVE, LOVE, LOVE my work so much. Thanks Tony! 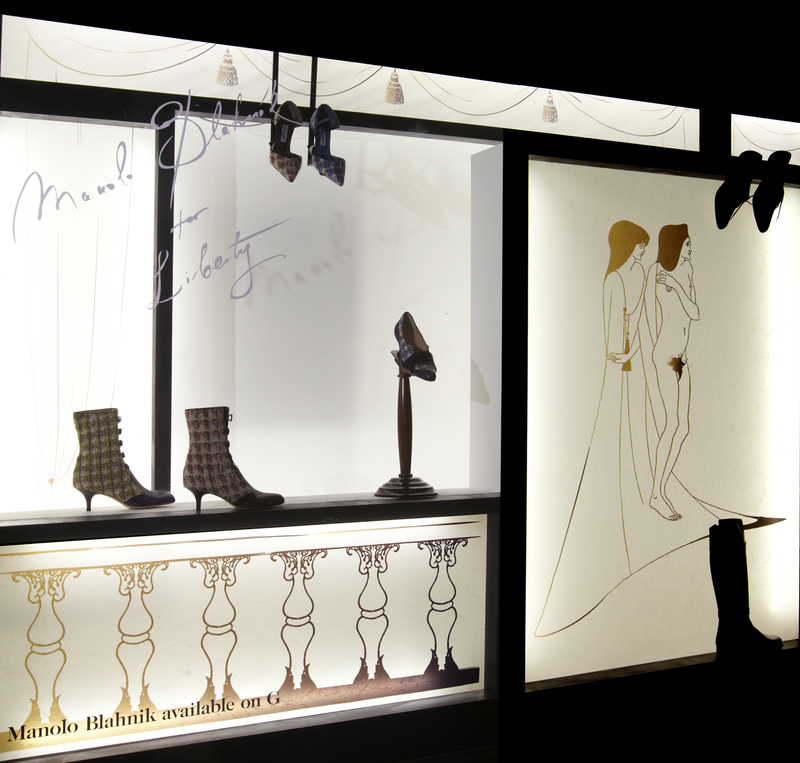 This October the World of Manolo Blahnik has come to the windows of Liberty in London. Manolo Blahnik has scoured through the Liberty Print archives to create this lust-worthy collection, spectacularly displayed, floating against an Art Nouveau romantic setting of illustration and Japanese screens. The full collection of exclusive shoes, notebooks, umbrellas and cushions all embellished with Blahnik’s beautiful illustrative flourishes are available in the stunning store-in-store, in residence for a 3 and a half month period. In collaboration with visual communications company Just So, the department store has turned their window landscape into a visual tour de force for the designs of the world’s most sought after shoe designer, so loved by every A-lister, most famously Sarah Jessica Parker who took the brand to iconic status in her role as Carrie Bradshaw. 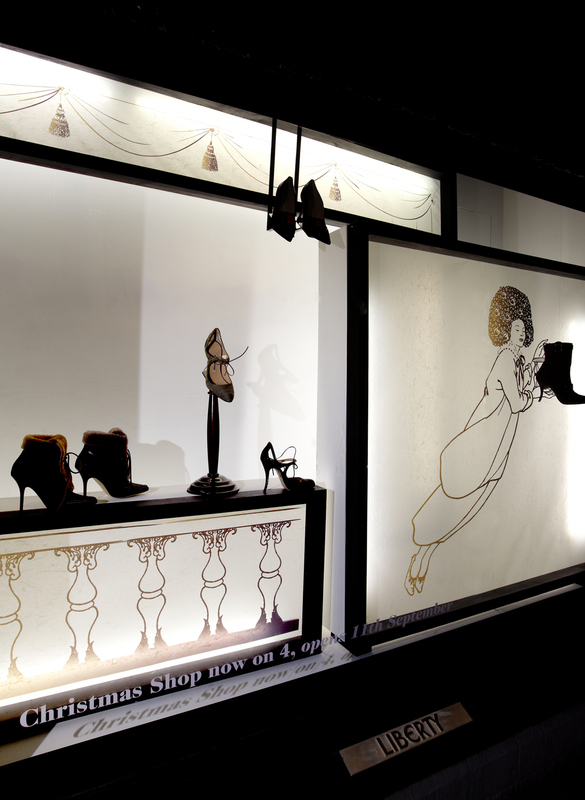 Displaying shoes in windows can be difficult because people tend to feel they have to over-embellish their windows. By adding too much stuff the merchandise can get lost. These windows are a perfect example of less is more. 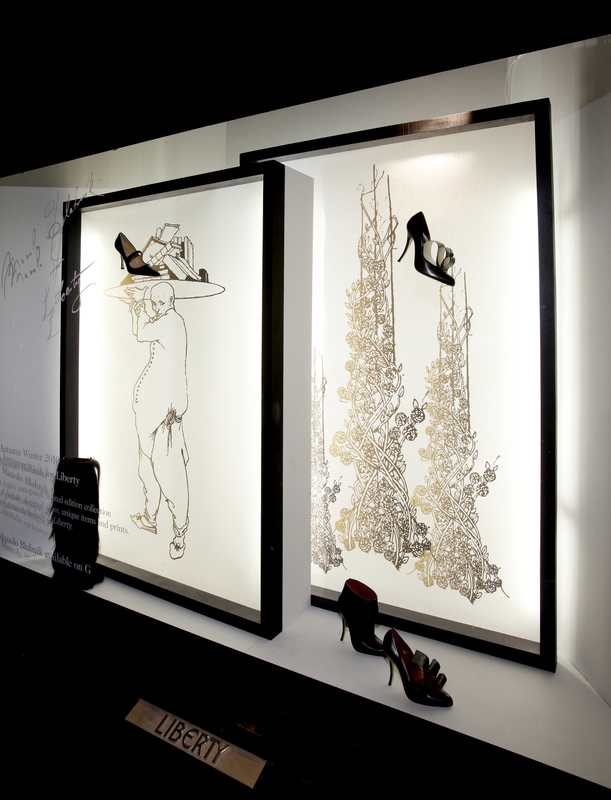 The simple art and lighted panels emphasize the shoes and draws your eyes to it rather than steal the focus away from it. This is simple and chic done really well, much like the Manolo’s we all covet!